A love of fabric led to a line of clothes. Clare Hare was on maternity leave from her investment banking job when she began to brainstorm with another new mom about a new venture. They came up with the idea of a line of maternity clothes that consisted of just five pieces. 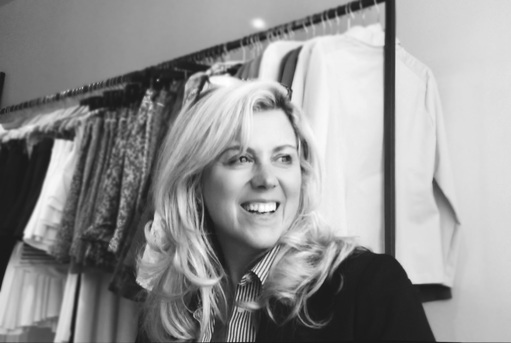 Clare put together a business plan, gathered funding and was ready to go. With a second child on the way and a family move to CT, the geography wasn't right and the idea was shelved. But a clothing line was never far from her mind and Clare went back to her business plan and the five piece idea in 2002. Loving the Liberty of London fabrics and other fine English textiles, she designed a skort, and other pieces followed one at a time: pants, shorts, a shirt and a tunic. Feeling that the timing was right, Clare found investors and decided to make the simple line happen this time. With a manufacturer in the garment district of New York City, she sourced fabrics, created patterns and tweaked them to get samples she was happy with. This took some time. Once she had the pieces complete, she focused on the administration. This was where her math skills came into play. "The hard part with a clothing line is making it profitable; there are so many financial areas to be conscious of, and production is all about the numbers." Clare loved the flexibility of having her own company, and with three boys, she was able to make her own schedule around their needs. Also, the fact that she created something that others liked was huge: "Seeing someone I didn't know wearing one of my skirts was so great. They actually bought my creation." Coming from the service industry it was very satisfying for Clare to create a product. Aside from occasionally getting seasonal interns to help with distribution, Clare does everything on her own and works solely from her home. She says the style of the line is, "classic, yet stylish," selling mostly to high-end golf clubs. "The fabrics sell my clothing. I don't think of myself as a fashion designer; I just love the fabrics and building a company around them." Knowing she could scale up and build volume, she chooses to remain smaller and more custom, saying "it's a lifestyle choice." Now offering her line on-line, she is seeing even more flexibility with e-commerce. That's what makes her successful: keeping it simple with just twelve pieces (as of summer 2016) and many fabulous fabrics.